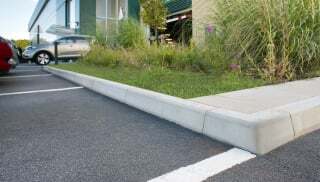 At Marshalls, we know that hard landscaping for city developments and highway projects have to meet certain standards and provide durable surfaces that can withstand increasing levels of traffic – that’s where Marshalls’ collection of bullnose kerbs can help. Pedestrian footfall and traffic take their toll on urban landscapes and our collection of bullnose kerbs deliver long-term performance and resilience. Marshalls' British Standard bullnose kerb stones offer a high quality level of edging and detail. Precision-manufactured and durable, they are used for highway schemes up and down the country. These products meet strict guidelines, adhering to the dimensions required in BS EN 1340-2003. They can also be integrated with a range of other paving products to provide a coordinated look. Search the full range now.